This simple recipe was a HUGE hit at our last pool party. Once the guys got a sip of it, they finished off their beers and started drinking the punch. I ended up making 3 batches. When I ran out of Coconut Rum I started using Myers. Coconut is my preference, but both were great! Super easy to make compared to other favorites of ours like Mojitos and Margaritas. 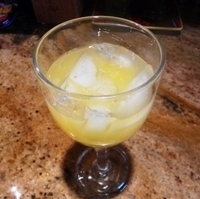 In a pitcher, combine lime juice, simple syrup, rum, bitters, and orange juice. Serve chilled over ice or just add ice to the pitcher if you expect it to be consumed quickly.